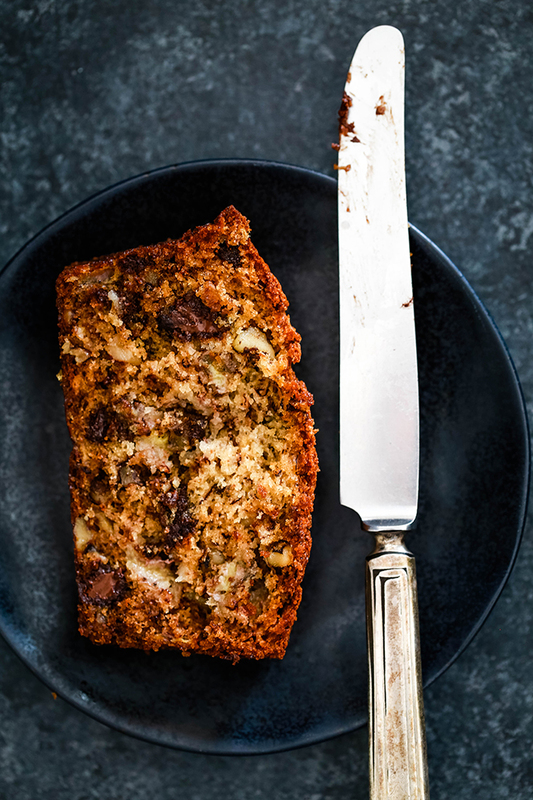 We are so addicted to this banana bread. It's so decadent and yummy. We did drop down to three bananas after making the first one with four and having issues with it cooking in the center (probably our doing rather than the extra banana). Anyway, we made it a couple of nights ago, and we're making it again tonight. I'm going to gain 30 pounds just from this banana bread, I swear! Brenda Lee, you're so kind! The best compliment ever! So glad you're enjoying it as much as we do. Thanks so much for taking the time to share your kind words! 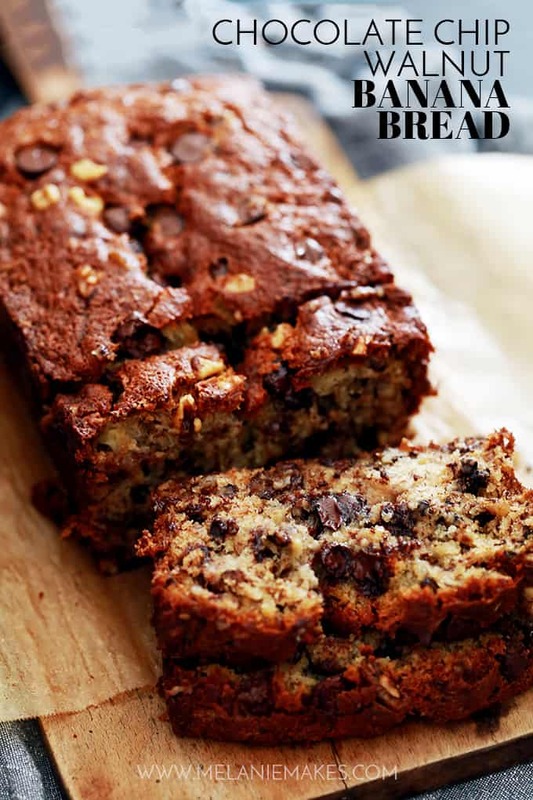 I made this recipe today after searching for chocolate chip walnut banana bread recipes. I am excited to say this was the most amazing banana bread recipe I’ve ever tried. Thank you so much for sharing ! You're so kind, Mike - thank you! So glad you enjoyed it as much as our family does! Hi Melanie! I've made your banana bread TWICE in the last six weeks. The first time had no butter or baking soda so used shortening and baking powder, omitted salt. Moist and flavorful, it lasted a day and a half. This morning, made it with no substitutions and they're not even letting it cool before slicing into it. Both times, I've made 1.5 recipe to fill a bundt pan and it really is gorgeous. I'll be highlighting your recipe in a few moments on Mayree's Deep South Cakery with a Side of Life on FB, complete with photo. 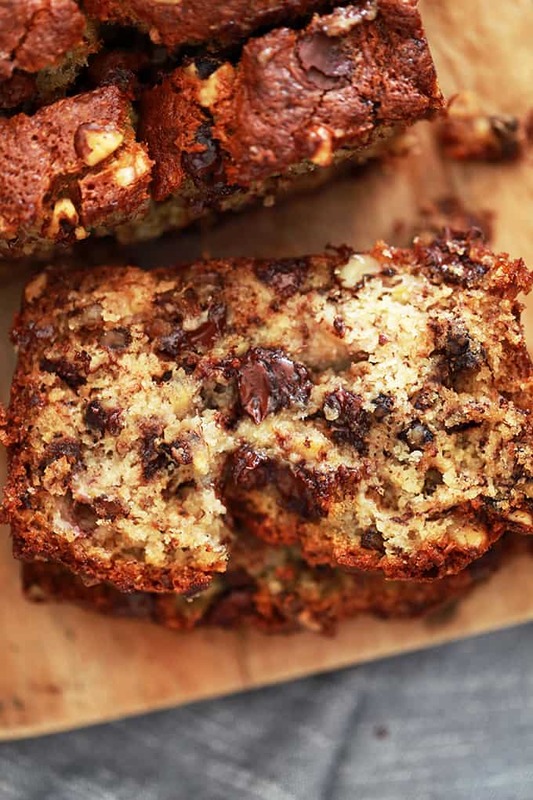 Thanks for coming up with a substitution-friendly banana bread recipe; we love it! I used brown sugar instead of white sugar. Does that make a difference? It's in the oven now, hope it turns out alright!! Hey, Ashley - I haven't tried this recipe with that substitution so I can't say for certain. Brown sugar contains molasses, which may change the texture and flavor, but the sweetness level will be the same. Let me know how it turns out! 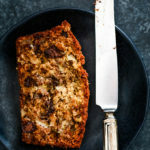 Hey Melanie, this is the best ever Banana walnut bread ever!! Mine is barely out of the oven and almost half of it has vanished. 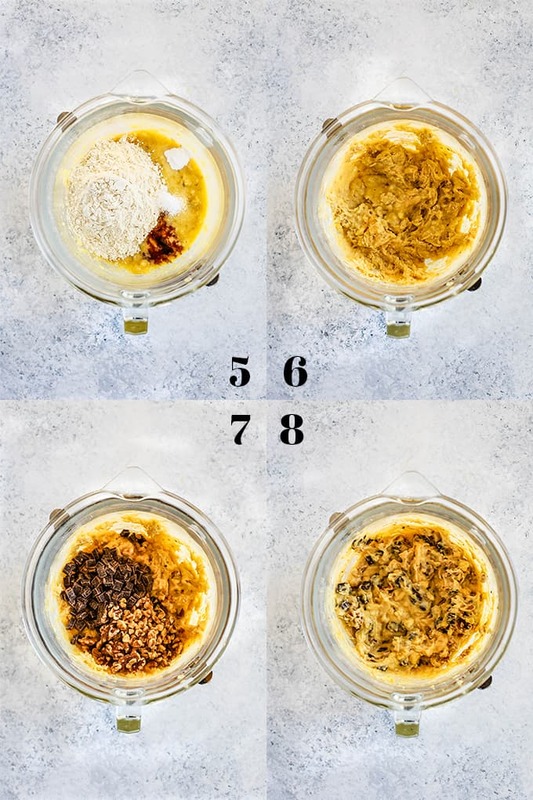 However do you know which egg substitute would work and what quantity? So glad you are enjoying it as much as we do, Kashish! I haven't ever used egg substitute in this recipe so I can't say for certain. You might try taking a look at the grocery store on the side of the packaging to see if they offer any suggestions. Banana bread is one of my favorite breakfasts. I can not wait to try it with walnuts and chocolate chips. My mouth is watering just thinking about it. I'm sure you'll love it, Stephanie! I’ve made this bread several times and my family continues to ask for it again and again. It is so delicious. My sister actually dropped some ripe bananas off at my door. She wants her own loaf. Question have you ever baked two at the same time. If so does it alter the baking time? Thanks for sharing this delicious recipe. It’s truly one of my favorites. This was way off on the temp and timing. After 55 minutes, it was completely uncooked in the middle and crusty on the very top. I’m having to do some experimenting to get this to cook without burning the rest. Hey, Ashley - So sorry this didn't work for you as I haven't had this issue. Wondering if the temperature in your oven might be a bit off? (I hate it when that happens!) Feel free to e-mail me as I'd love to help you troubleshoot. This is one of my most popular recipes and I haven't had this type of comment before. What can be the alternative for eggs, if I don’t want to put eggs?? Hi, Aakriti - I haven't tested this recipe using an alternative so I can't say for certain. I toasted the walnuts first, what a decadent flavor! Love that extra step, Lori! Hi, Sbeen! I'm laughing to myself as three of my four babies were two weeks overdue. Hang in there, mama! You'll want to put this - and most recipe unless they specify otherwise - on the middle rack as this allows the air to circulate around the pan easier. No burning! Can't wait to hear what you think of this recipe - hopefully it satisfies your craving! Hi Melanie,Thank you for the reply. I’m on baby number 2 and scheduled for April 7th. Some health issues but thank you for the warm wishes. The banana bread is getting me through. I made the first load and it was absolutely amazing! It. Was a little burnt in the edges and bottom because of the bottom rack But still amazing! I gave my neighbors some too and they loved it. It’s the best I ever had and I was so proud of myself. I just put in another loaf today as the first one is almost demolished. My 3 year old loves it too. Thank you for the love you shared and I can pass this dome to my girls one day. It will be my go to recipe. I have put the loaf on the middle rack and now on count down.... wishing you well and thank you so much ???????? Sbeen - Your words made my day - so glad that you and your family enjoyed it. Neighbors too! Wishing you a safe delivery! 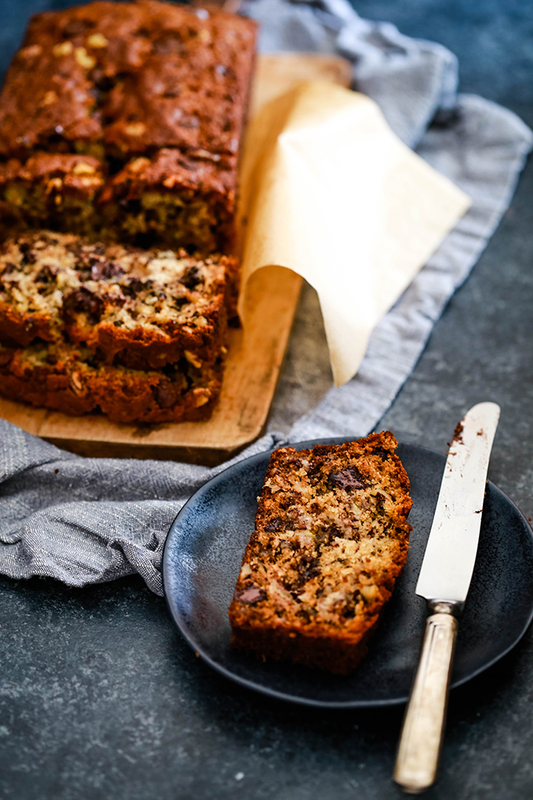 I have a recipe for banana bread that calls for mini chocolate chips, if I use them it seems like a cup of them might be too much, what's your opinion? Hi, Jane - Not knowing the recipe, I can't say for certain. I like using the regular chocolate chips for bigger pockets of chocolate! Hi, Claire - Thanks so much for checking in! I've never had this happen to any of the loaves I've made of this bread, nor received this feedback. I even have a loaf under a cake dome in my kitchen that I made last week that's still as soft as when it came out of the oven as I typically make two loaves at once. Definitely feel free to shoot me an e-mail as I'd love to help you troubleshoot! Usually I never comment on anything. But I found this recipe and omg I love it!!! The bread cracked in the middle beautifully. I sent pictures to my relatieves and they couldn’t believe that I made such a beautiful thing (lol). It’s so picture perfect. Sticked to the recipe. My bananas were almost completely black! Thank you, Melanie for the amazing recipe. Now I’m a new member of your blog. Good luck! Angie - Your comment was the first thing I read this morning and you totally made my day! So happy that you enjoyed it and took the time to let me know. Appreciate it more than you know! May i know the size of the loaf pan used for this recipe? Thank you. Hi, Yan - I use a standard 8.5" x 4.5" bread pan for this recipe. Hope that helps! So I will admit I was worried about this recipe cooking completely through with all the bananas. I have made a ton of banana breads in my life..this is by far the BEST one I have made. It cooked perfectly through and it tastes absolutely delicious! 10 out of 10 in my books. 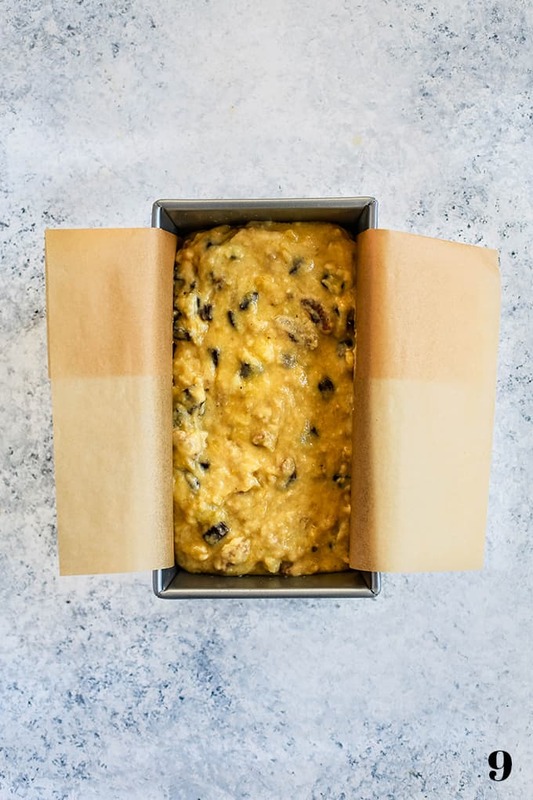 Thank you so much for your kind words, Laurie - I agree, this is my favorite banana bread recipe in the entire world! Seriously the best recipe I've tried! And I've tried a million because I can't ever remember which one I tried and liked lol. Delicious! You're so incredibly kind, Sarah - thank you! And thank you for taking the time to let me know you enjoyed it. Totally made my day! Can I use a cake pan for the recipe? ???? Hi, Aarti - I haven't tested this recipe in a cake pan so I can't say for certain it would work. Let me know your results if you give it a try! I have never commented on any recipe before but this one made me put my fingers to the keys. It was absolutely DIVINE! 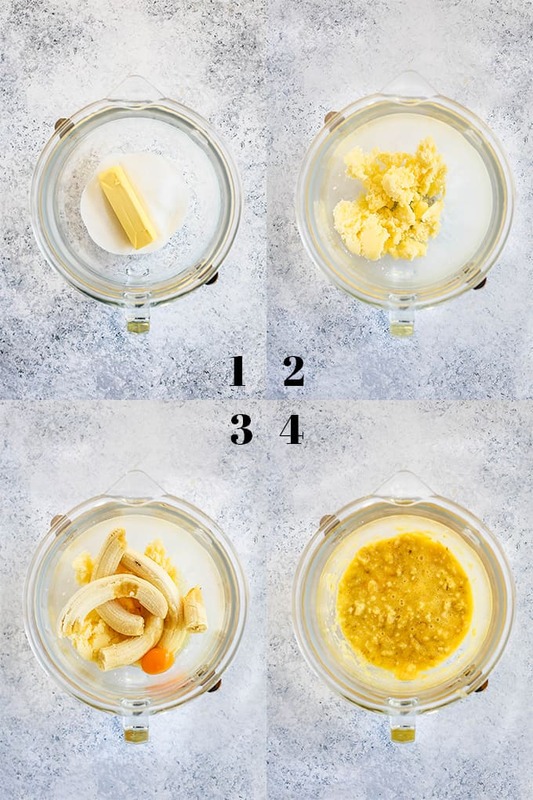 I love baking banana bread and have tried many recipes... but this is hands down, the BEST ever! I made it for a friend's birthday and everyone went nuts! It got polished off in ten minutes. Thank you for this, and making it even more appealing with the great pictures! You are so incredibly kind, Varsha - thank you! I actually read your comment aloud to my family as it totally made my day! Thank you so much for taking the time to comment! What do you mean by "tent?" Hi, Denise - You'll simply use a piece of aluminum foil and fold it in half to create a "tent" like shape to lay across the top. Hope that helps! Perfect, thanks! I forgot that was an option. For anyone else interested, I calculated that each slice is roughly 475 calories. Hi - lovely recipe! Do you have a ballpark estimate of how many calories each slice (or even total) would be? I can't wait to try it...I did not have walnuts so I added pecans..???? Can't wait to hear what you think, Lourdes! Just made a loaf myself this past weekend and it's already gone! I just had some. It the best I've ever tasted or made. Thank you for this great recipe. The pecan are yummy.???? So glad you enjoyed it! Thanks so much for taking the time to let me know - so appreciate it! It came out soft and delicious. I would give it 8 out of 10 stars. Now i'm soooo stuffed. I had about 3 slices so far and i'm still wanting more. Thank you so much for this delicious recipe. I had to laugh at your rating - wondering what would make it 10 out of 10? :) So glad you enjoyed it - thank you so much for taking the time to let me know you loved it! my banana nut bread is in the oven. It looks good so far. Can't wait to try !!! Im not sure if it's the altitude but so far, it's been baking for an hour and 15 minutes and it's still mushy banana in the center. I've even turned the heat up to 400. 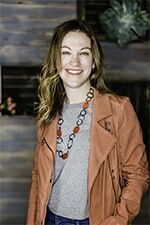 Hi, Melissa - I've made this recipe in three different states and we're currently living at higher altitude in Colorado. I haven't had any issues with the bread setting when following this recipe. Feel free to e-mail me and I can help you troubleshoot! This looks delicious!! I want to make it today but I only have brown sugar here, will that work or should it be used with white sugar? Thanks! Hi, Amanda - thank you! I haven't tested this recipe with brown sugar, so I can't say for certain about substituting. Hands down THE BEST banana bread I've ever made. I already tossed out my original, handy dandy, go-to recipe I had used for 20yrs. Fan-freaking-tastic. When my daughter asked how it turned out I said "This recipe belongs in the vault". Thank you thank you thank you Google for finding me this amazing recipe. Hands down the best compliment ever! Thank you so much, Romie - you completely made my day. So glad you and your family are enjoying this recipe and that you took the time to let me know. So appreciate it! Mary, you are so kind! I read your comment aloud to my husband as it was so flattering. So glad that you enjoy it as well as those around you. Thank you so much for taking the time to let me know - so appreciate it! It looks so delicious. Makes watering in my mouth. Can't wait to try this recipe. Thanks so much, Christy - hope you'll let me know what you think if you give it a try! I made this for the first time last week and it was gone the same day! My grandsons asked if I would please make it again as it is their new favorite, so here I am baking it right now. Thanks for an excellent recipe! Suzanne, you totally made my day! So glad that your family loves this bread as much as mine does. Thank you so much for taking the time to let me know you enjoyed it - so appreciate it! Thanks so much for totally making my day, Monica - so appreciate your kind words and you taking the time to let me know you enjoyed it! I came for the banana bread but stayed for the deliciously melty looking chocolate!! ;) This sounds so good, I'll definitely be trying it! Oh yes, Kaylie - the chocolate gets me every time! Might I recommend using dark chocolate chips? They're divine in this recipe! Let me know what you think if you give it a try! This is so so delicious. Best banana bread hands down. I'm never looking back. I made it with dark chocolate chips because that's all I had and was great. Thank you!! The nicest compliment ever, Ciara - thank you so much for taking the time to let me know you enjoyed it! Can this be used to make muffins? How should the baking time be altered? Would love to make muffins for an on the go work breakfast! Hi, Loey - I haven't used this recipe for muffins so I can't say for sure. You definitely could use the sliced bread for an on the go breakfast, though! I've made this recipe at least a half dozen times and it's always SO GOOD. I normally make mini loaves but tonight I'm going to try to make them into muffins, as the store was out of loaf tins. If you attempted it Loey, then please let me know how it went. Hope it worked well for you, Leslie! YES! Awesome, Leslie - so glad you're enjoying the recipe! Hey, M - When I've made these as muffins, I usually check them around 20 minutes. Hope that helps! After preheaiting how much temperature should be maintained?? Hi, Manika - The preheat temperature is the same temperature that the bread is baked at. Hi, I want to know what is the worst mistake you can make with this recipie? The worst mistake you could make with this recipe would be to not make it!! I gave it a try and it is perfection. You will not regret it! Thank you so much for the kind words, Amanda - best compliment ever! This recipe looks so moist. I am going to try very very soon. One question though. What happens if you only added three bananas? I haven't tried it with only 3 so can't say for sure. It'll likely just be a little less moist. Let me know if you give it a try that way! Loved the recipe, very banana-y!I do have a question, why the additional 15 minutes in the turned off oven? Is it to dry it out a bit?I used the recipe but put mine in mini-loaf tins on special request. Had to estimate the time required. It turned out great, maybe a softer consistency on the inside than expected, as in a "just-cooked" feel & taste. I didn't leave mine in the turned off oven at all, so wondering if that would have helped things? Hi, Fatima - You're exactly right! The extra time in the turned off oven just allows for a bit more of a cooked consistency as this is indeed a very soft bread! Your recipe looks delicious! I just had one question: does it make a difference if I use unsalted butter instead of the regular one? Thanks! Hi, Shreya - thank you! I use unsalted butter in all of my recipes as I like to control the amount of salt in my recipes. It's definitely a personal preference but if you do use salted butter, you'll want to watch how much additional salt you add. Do I Sift the flour? I seem to have toouch for one loaf. What size loaf pan did you use? Thank you! Hi, Nola - I used a standard 8.5"x4.5"x2.5" pan. Hope that helps! I'll take any excuse to have chocolate for breakfast! This bread looks so good. I can just imagine biting into a warm, gooey slice! Warm is definitely best, Jennifer! I am dying at the thought of this bread!!! 4 bananas...I can only imagine how absolutely delicious this must be! Perfect breakfast food for sure!!! I like the way you think, Angie - I totally agree! Melanie!! How are you?!!! 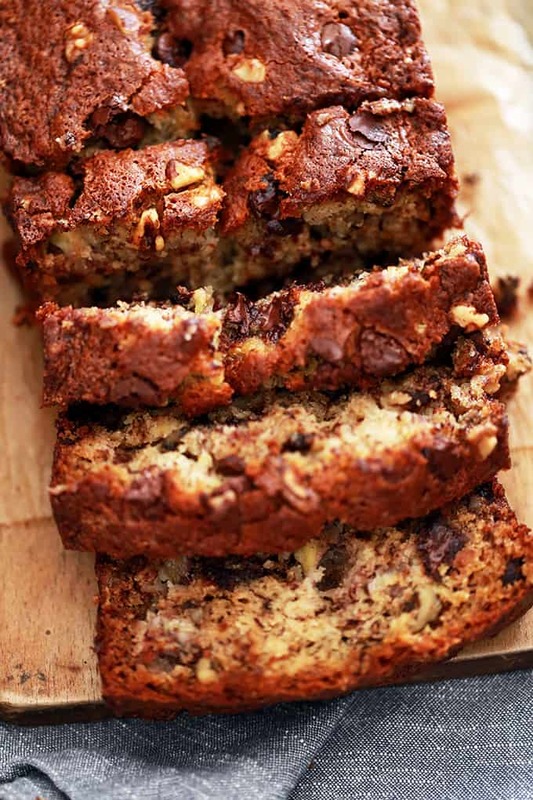 I could eat banana bread all day long. . heading over to get the recipe! Thanks so much, Alice - hands down my new favorite bread recipe! 4 bananas? OMG! The softness!! And the richness! I agree - this is the best one! LOVE it! Absolutely, Kate - thanks so much! 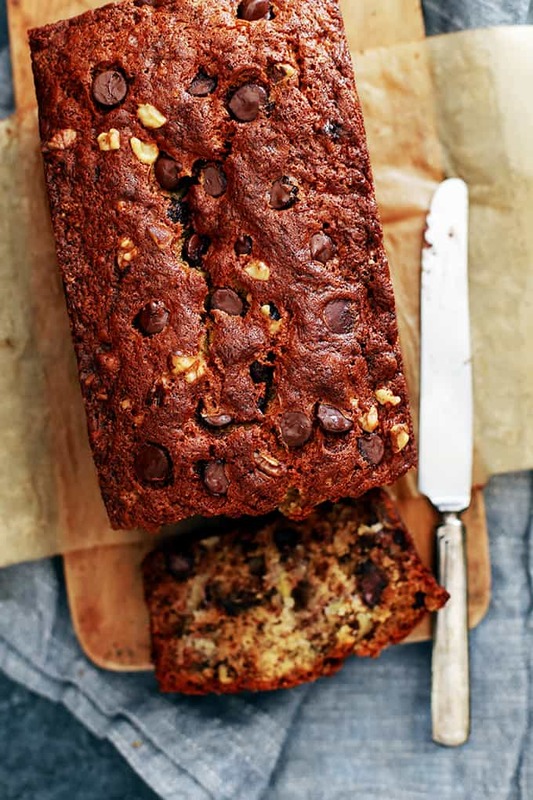 Visiting from Saturday Night Fever, This looks like a lovely banana loaf, love the addition of all those banana's, plus the choc chips and walnuts. I co-host Sweet and Savoury Sunday and would love for you to stop by and share this and other recipes with us. Have a great day! 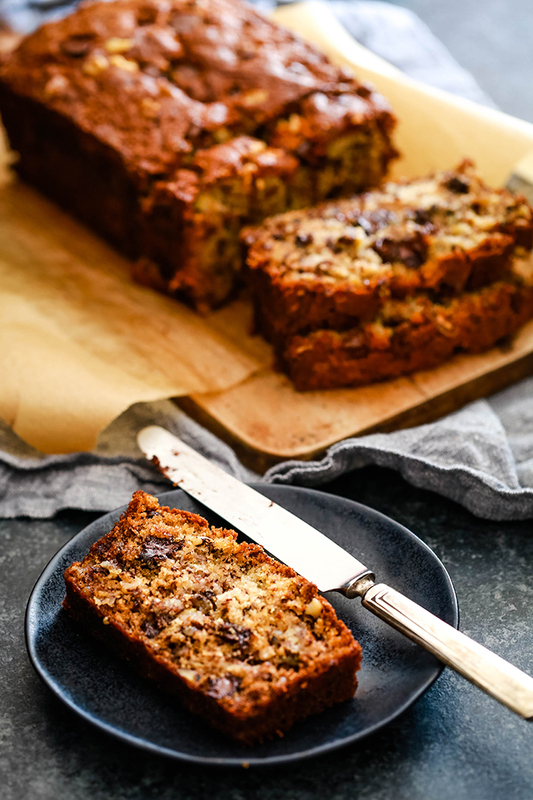 Banana bread is always an appropriate breakfast food! This one looks lovely! I love all the chocolate chips!